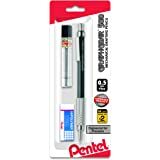 Amazon's Choice for "pentel graphlet"
Sold by PureFamily and Fulfilled by Amazon. Ships from and sold by weeea2. 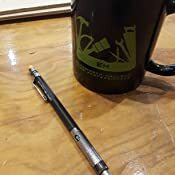 5.0 out of 5 starsLove this pencil. I love this pencil. Love it above all others. So much so that I can't quite draw if I don't have one. It's become part of my process. I've tried many pencils over the years and this one is by far the sturdiest. I've had problems with other brands dropping the lead out or breaking the tip constantly but not with these. Please don't ever stop making them. I'm begging. 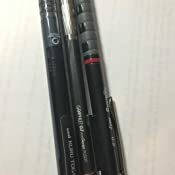 I really enjoy this series of mechanical pencils. 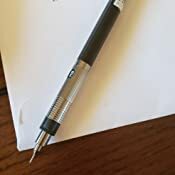 One of the first things I noticed when getting my first one for my set was that the metal barrel just before the tip of the pencil will rotate to allow you to mark what type of lead is in the pencil. 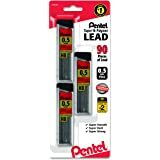 This is great to mark HB, H, 2H, 2B, or B lead type contained within the pencil in case you prefer to use a softer or harder lead type with a certain mm point. The other thing I noticed was that these pencils are nicely marked with the eraser cap displaying a color and clear number for the mm lead type: .3 = brown, .4 = green, .5 = black, .7 = light blue, or .9 = yellow. 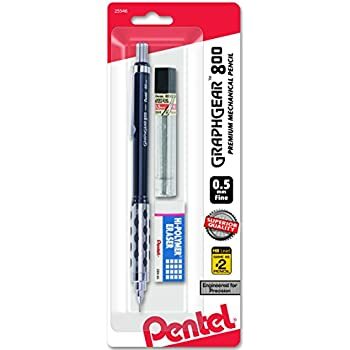 If you've used any of the Pentel brand pencils that have the skinny erasers (I believe its a Z2 series) then those will fit when you need replacement easily into these pencils. 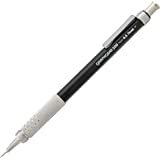 There's a bit of heft to their weigh, but it's more concentrated towards the tip to allow for the pencil to rest in your hand and not worry about it being top heavy or difficult to glide on paper for detail work. If you do a lot of detail work, these pencils are worth collecting a full set. I'm glad I discovered this particular series of mechanical pencils. 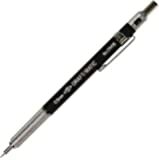 After breaking one too many .5mm leads using the cheap BIC pencils, I finally decided to invest in better writing tools. I wish I had done that sooner! These pencils are wonderful, precise, easy to write with, and certainly look a lot sleeker and professional. I'm a musician, not a drafter, but precision is important when notating small notes and rests on a tiny musical staff. 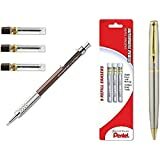 I highly recommend these, and will continue to seek out better pens and pencils, now that I know what I had been missing! First off the metal is a smooth and knurled combination it makes sure that it wont slip. The pencil has a lead indicator too which I think is a pretty cool feature. 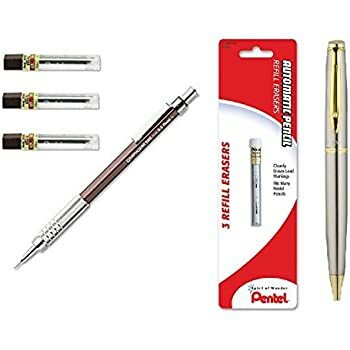 I ordered a .4mm lead (it was cheaper) and it comes with 5 pieces of lead already inside, it I was afraid it would jam up with so many pieces of lead but, it comes with in the eraser a metal stick that helps de clog the pencil. On the cap of the pencil it has the lead size that you ordered. The one thing I don't like is that the body is plastic and that gives a cheaper feel to the pencil. I will not down vote the product because of the quality of the package.I received the pencil in a loose package wrapped with newspaper and no original box,second the box looked as if the thing had been run over. I was quite sad about this because I had ordered many times from santa trading japan they usually ship top quality but this disappoints me. the metal tip came bent and the lead wouldn't come through but I fixed that. I have the graphgear 1000 for 10 years and wanted to try out other varieties. If you're used to the weight of the graphgear you will most likely won't enjoy this pencil. The body is plastic and feels kinda cheap in comparison to the metal body of the graphgear. I would try a rotring instead. If you like lightweight pencils, then this is a good choice for you. I really liked that this pencil was thinner than my old one because I can use it for a longer time without my hand cramping. It also has a nice sturdy weight, it doesn't feel flimsy or cheap. The lead moves out very little when you click it but, although lightly irritating on occasion, is good because if you have a lot of lead sticking out when you write it breaks really easily. I only click it twice each time the lead runs down and that has worked best for me. I do write with more pressure than necessary though so other might have the lead sticking out more without it breaking a lot. It comes with a little (its actually pretty long and sits in a metal holder so you can move it up as you use it if you choose) eraser which I don't use because I find the hassle of replacing them to be more than its worth. I also carry a thin pencil eraser and a larger block eraser with me because, as a student and constant doodler, I erase a lot. (and when you're taking notes in a lecture you don't always have the time to take the cover off the back of your pencil to erase a mistake). 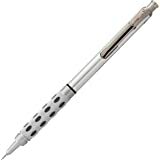 The eraser also has a little metal rod stuck into the bottom of it that is also .3 sized to use if you accidentally break of small pieces of lead and they're stuck inside the tip. The lead I'm currently using is HB but I'll probably start using B or 2B once I run out because I like the writing dark, and as stated earlier, its not very easy to write with a lot of pressure and not break the lead. I gotta say, this is my very favorite pencil. I own a variety of drafting pencils, and out of them this one has shone the most. To me, it is the most aesthetically pleasing. In my hand the diameter is fairly comfortable, and the metal grip does not chafe or become uncomfortable. Its weight is also fairly light, so you may use it for longer with less fatigue. 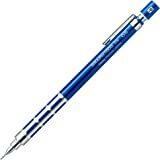 To whit, I have used this pencil the most, and surprisingly, the lead advancement mechanism fails the least out of all the pencils I own. 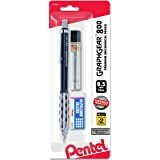 5.0 out of 5 starsMy go-to pencil! 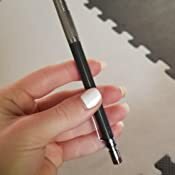 Just got this pencil for my everyday writing, and I had to jump on here to write a review because the quality for the cost is really impressive. Not only is it very sturdy, but it also looks professional and well-built. There's a cap on the eraser to keep it from getting dirty, which may seem excessive, but I think it's good to have just in case you'd like it. I also prefer this ribbed grip to the rubber kinds that most other pencils have. Now I do wish the pencil came in other colors, but I can't complain about the slick black color. All in all, the design is great and I can only imagine this pencil will be at my side for awhile!